Police Chief Eliot Isaac shakes the hand of Officer Antonio Etter, who left a nearby off-duty detail and engaged the shooter with his own gun. He recieved the Medal of Valor Monday for his actions. 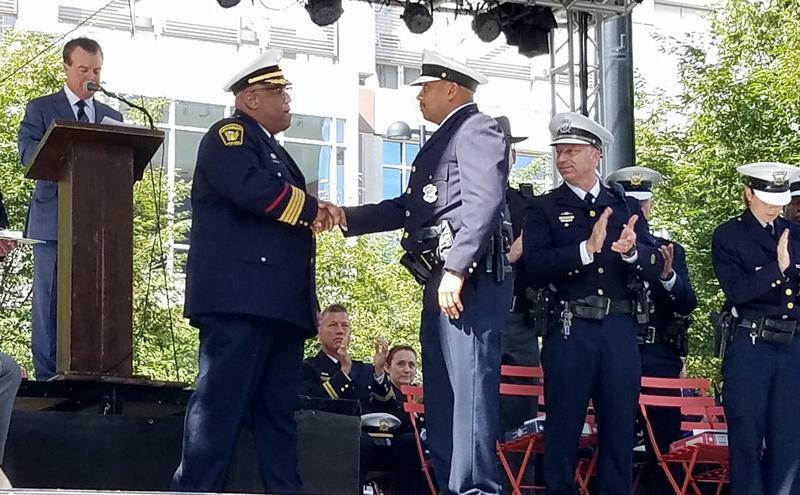 Standing before a crowd on the square Monday morning, Cincinnati Police Chief Eliot Isaac began by asking for a moment of silence for the victims of the September 6 shooting that killed three and wounded two others. "Today we want to take the opportunity to thank those who took decisive action to end the danger and to protect those that were injured on that tragic day on September the sixth," Isaac said. He also thanked the dispatchers, call takers, the Cincinnati Fire Department, EMTs, paramedics and others who helped, including more than 200 officers and civilian staff that provided "critical" support. 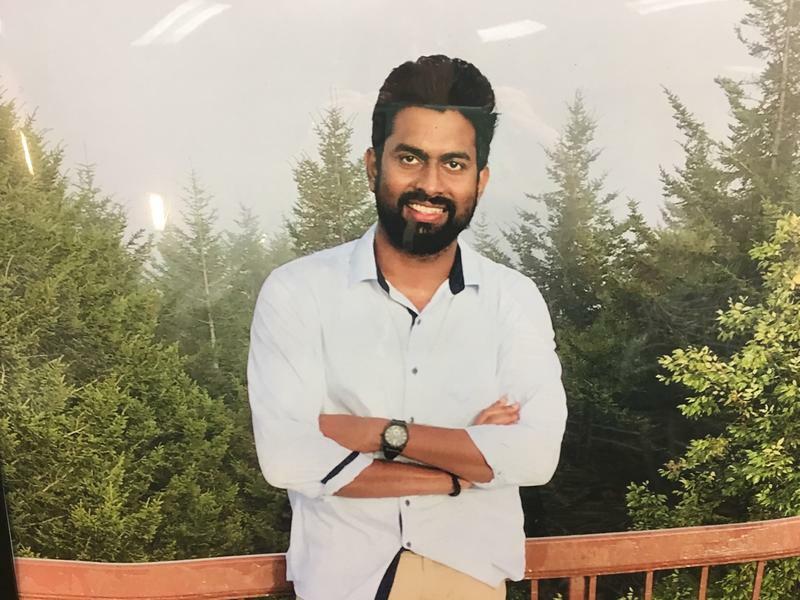 "I personally want to commend each and every one of these individuals that I mentioned for going above and beyond the call of duty, and the sacrifices that they make each and every day," Isaac said. "I am truly proud to be a part of the greatest police department in the country, and I am proud of how this community truly came together. Today we are Cincinnati Strong." Officer Jennifer Chilton earned the Medal of Valor for engaging the shooting suspect with her own weapon and without regard for her own safety. Nine officers received the Medal of Valor for "exhibiting an extraordinary act of bravery without regard for their own personal safety, and no duty to act is required or engage in combat with an armed and dangerous adversary, and face an unusually high risk of sustaining serious physical injury while displaying great courage, professionalism, and dedication to duty to prevail over the situation or adversary." One Sheriff's Deputy received the Sheriff's Award of Merit; 11 officers received the Police Chief's Award for Distinguished Service; one dispatcher was awarded a Citizen Award Of Commendation; and two civilians - one bank employee and a bank security guard - were awarded the Citizen Award Of Bravery. 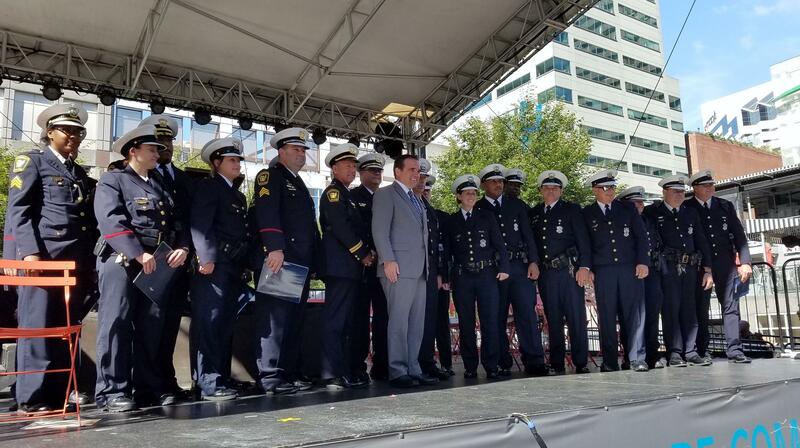 Cincinnati Mayor John Cranley expressed pride in the honorees for their service. "You have earned this recognition. You have shown the essence of public service." He encouraged the crowd to show their appreciate with a round of applause. Those gathered on the square responded with a standing ovation. These officers were awarded Monday for their bravery and work on September 6. Specialist Gregory J. Toyeas – who, once on scene and without regard for his own personal safety, ran past the shooter and then engaged him with his firearm, forcing the shooter to run toward the other officers on scene. Officer Jennifer M. Chilton – who as part of the team, engaged him with her firearm and did so without regard to her own personal safety. Officer Antonio D. Etter – who was working a nearby off-duty detail, left his detail and engaged the shooter with his firearm, doing so without regard to his own personal safety. Officer Eric A. Kaminsky – who as part of the team, ultimately engaged the shooter with his firearm, doing so without regard to his own personal safety. Specialist Robert C. Boyce – who on his last day before retirement worked as part of the team, who ultimately engaged the shooter, did so without regard to his own personal safety. Specialist Jennifer A. Luke – who, approaching the building from the south, worked as part of the team, and who ultimately engaged the shooter, did so without regard to her own personal safety. Specialist Thomas J. Sandmann - who was entering the building from the east, worked as part of the team, who ultimately engaged the shooter, doing so without regard to his own personal safety. Officer Alphonso J. Staples - who approached the building from the south, worked as part of the team, who ultimately engaged the shooter, doing so without regard to his own personal safety. Not knowing if there were additional threats, Officer Staples then assisted in the movement of a severely shot victim to a safe location outside the building. Officer Joshua F. Condon - who left his off-duty detail in the West End, approached the building just as the suspect was engaged by other officers. Officer Condon rushed into the building and immediately began life-saving measures to a victim of the shooting. Officer Condon did so using his own personal trauma kit and not knowing if there were additional threats that had not yet been neutralized. Hamilton County Sheriff Deputy James York was assigned to campus patrol and responded to the report of an active shooter. Deputy York, entering the building from the east, worked as part of the team, who ultimately engaged the shooter, doing so without regard to his own personal safety. 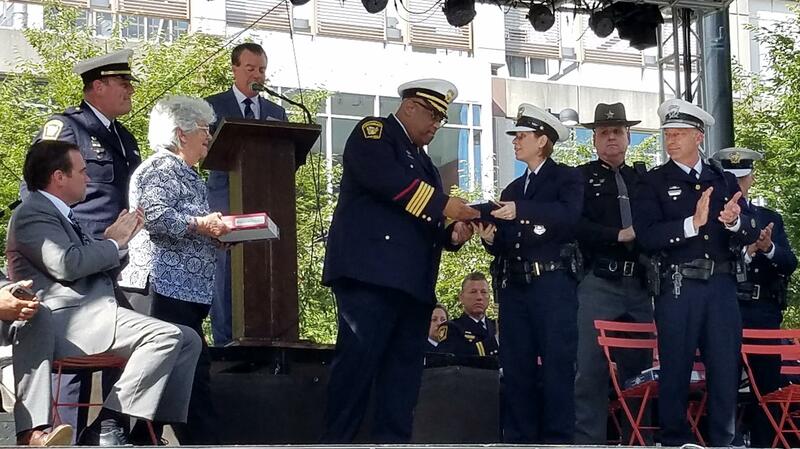 Captain Michael U. Neville - was thanked for his quick, decisive actions to providing incident command management at the scene in the first minutes of the event, protecting the lives of others. His leadership in the critical ensuing moments of this incident certainly assisted with on-scene management and obtaining additional departmental resources. Sergeant David A. Corlett – as the first supervisor on scene, Sergeant Corlett took immediate control of the crime scene and without hesitation directed decisive actions which led to a quick de-escalation of this critical incident. 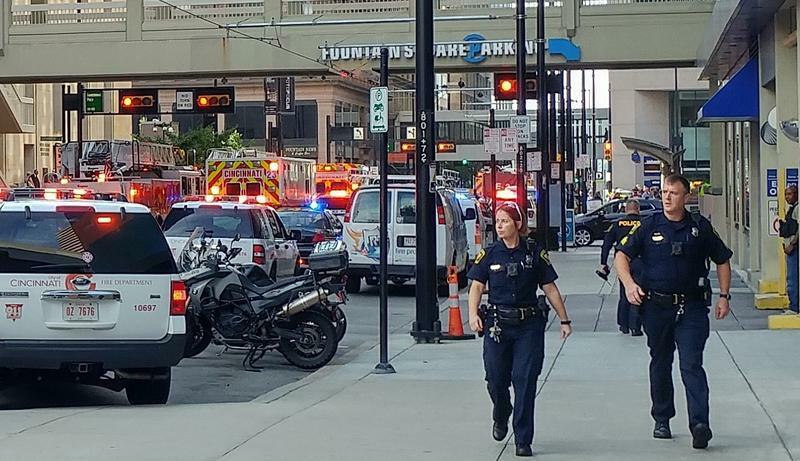 Sergeant Kara L. Graves – arrived on scene as a critically injured victim was being evacuated from the building. Working with others, Sergeant Graves rendered life-saving aid by applying a tourniquet to one of the victims. Sergeant David W. Moore – one of the first supervisors on scene, Sergeant Moore took immediate control of the crime scene management and without hesitation directed decisive actions which led to a quick de-escalation of this critical incident. Specialist Scott H. Johnson - arrived on scene and assisted in the clearing of part of the building and then rendered life-saving aid to victims of the incident. Officer Darrin L. Hoderlein - arrived on scene and assisted in the clearing of part of the building and then rendered life-saving aid to victims of the incident. Officer Brett T. Stratmann - arrived on scene and assisted in the clearing of part of the building and then rendered life-saving aid to victims of the incident. Officer Timothy M. Eppstein - arrived on scene and assisted in the clearing of part of the building and then rendered life-saving aid to victims of the incident. Officer Tamera Brown - arrived on scene and assisted in the clearing of part of the building and then rendered life-saving aid to victims of the incident. Officer Kenneth L. Kober - arrived on scene and assisted in the clearing of part of the building and then rendered life-saving aid to victims of the incident. Officer Amber R. Bolte - arrived on scene and assisted in the clearing of part of the building and then rendered life-saving aid to victims of the incident. 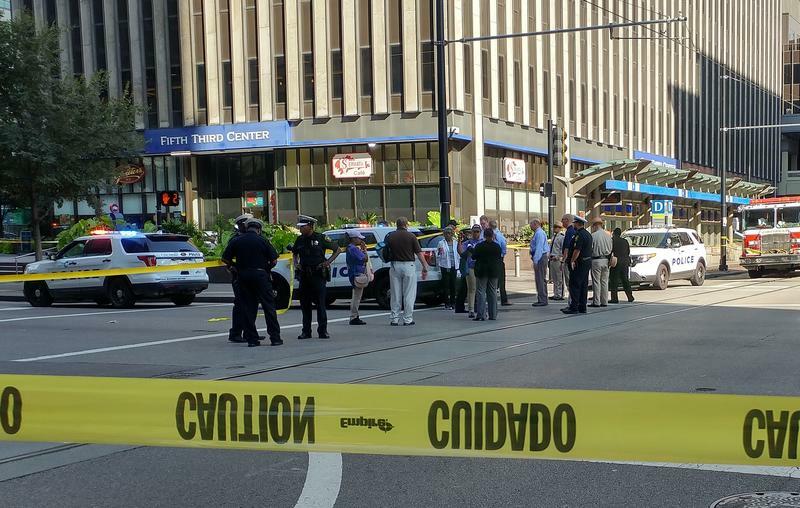 Mr. Thomas Ritter of Fifth Third Bank – Mr. Ritter was in the lobby of the Fifth Third Building adjacent to the Dunkin' Donuts stand when the shooting began. Without regard to his own safety, Mr. Ritter pulled numerous people entering the tower to a point of safety behind the display cases of the stand. There is no doubt that without Mr. Ritter’s actions there would have been additional victims during the incident. Security Officer Jared Drahman - working as a security officer in the lobby of the Fifth Third Building when the shooting began. Without regard to his own safety, Security Officer Drahman ushered people in the lobby to a point of safety. There is no doubt that without Security Officer Drahman’s actions there would have been additional victims during the incident. Dispatcher Maranda Monson – Dispatcher Monson was the dispatcher on the incident channel when initial calls began to flood the city’s Emergency Communications Section. Dispatcher Monson gave clear and concise information to responding officers which allowed them to approach the suspect in a safe and tactical manner. There is no doubt that without the direction of Dispatcher Monson there would have been additional victims that might have included law enforcement officers. 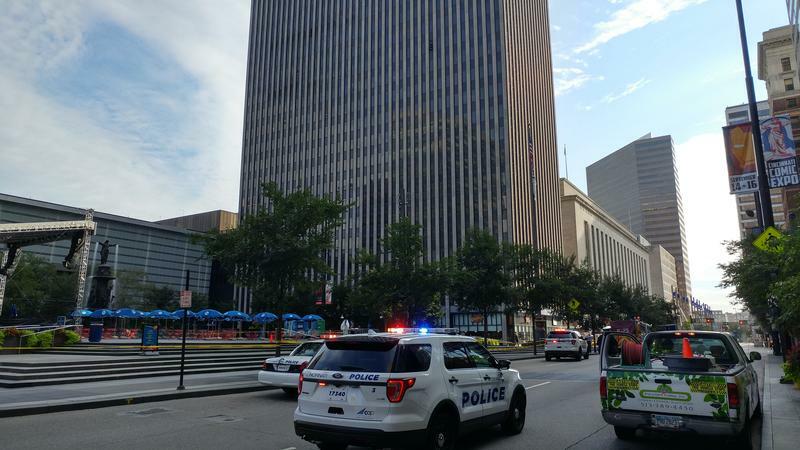 Prosecutor: Cincinnati Officers "Were Heroic"
Hamilton County's prosecutor says the four Cincinnati Police officers involved in a Fountain Square bank shooting did nothing wrong. Joe Deters says the officers acted heroically and saved lives when they shot and killed 29-year-old Omar Enrique Santa-Perez last week.